This is College Physics Answers with Shaun Dychko. There's going to be a small current that goes through the insulator that supports the wire above the metal tower and the resistance in the insulator is one times ten to the nine ohms. The voltage between the wire and the ground is 200 kilovolts which we convert into volts by multiplying by ten to the three. 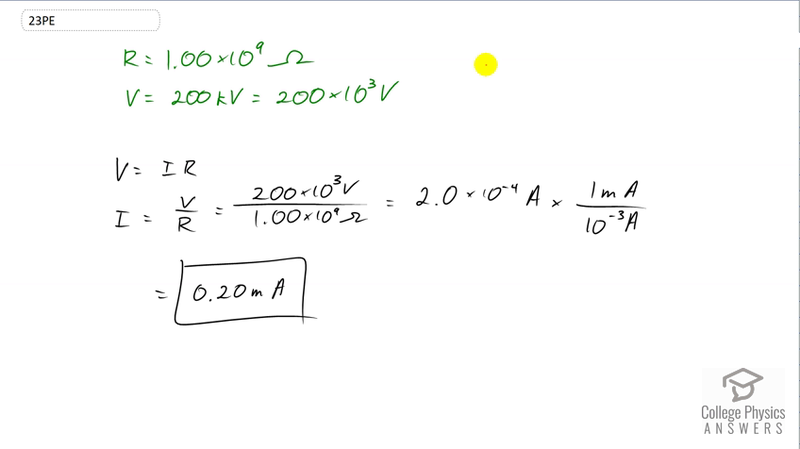 So we know that V equals I R, that's Ohm's Law, and we'll solve this for current which is I by dividing both sides by R. So I is V over R. So we have 200 times ten to the three volts divided by one times ten to the nine ohms which gives 2.0 times ten to the minus four amps. It's just a little nicer to write this in milliamps, so we multiply by one milliamp for every ten to the minus three amps and the amps cancel leaving us with milliamps. This is 0.20 milliamps.